The total Eagle Ford Shale rig count was unchanged this week, though operators increased horizontal drilling in the area. There were 86 rigs running across our coverage area by midday Friday. In recent industry news, crude oil prices dipped in February after hitting a two-year high last month. A total of 978 oil and gas rigs were running across the United States this week. 179 rigs were targeting natural gas (+2) and 799 were targeting oil (+1) in the U.S. The remainder were drilling service wells (e.g. disposal wells, injection wells, etc.) 482 of the rigs active in the U.S. were running in Texas. 11 rigs in the Eagle Ford region targeted natural gas this week with the commodity trading at $2.63/mmbtu. 75 Eagle Ford rigs were targeting oil with WTI oil prices at $63.55, an increase of $1.87 from last week. A total of 86 rigs are drilling horizontal wells, one is drilling directional and one is vertical. Karnes County leads activity in the region with 16 rigs in production. See the full list below in the Eagle Ford Shale Drilling by County below. Oil prices dipped in February after hitting a two-year high last month. After floundering for over two years, crude oil prices rose steadily over the last half of 2017, finally making its way back into the $60 range. West Texas crude prices peaked in January 2018 and have at $66.14 and then dipped back to the 50's over the past two weeks. Saudi Arabia's Energy Minister, Khalid Al-Falih, called for further cuts to production last week in order to tighten up the market. At the same time, the U.S. is seeing the highest levels of production in decades. The Eagle Ford Shale rig count increased by two this week, pushing the number to 86 rigs running across our coverage area by midday Friday. In recent Eagle Ford news, the Texas Railroad Commission (RRC) announced it granted more permits in January than last year at this time. A total of 975 oil and gas rigs were running across the United States this week. 177 rigs were targeting natural gas (-7) and 798 were targeting oil (+7) in the U.S. The remainder were drilling service wells (e.g. disposal wells, injection wells, etc.) 479 of the rigs active in the U.S. were running in Texas. 9 rigs in the Eagle Ford region targeted natural gas this week with the commodity trading at $2.56/mmbtu. 77 Eagle Ford rigs were targeting oil with WTI oil prices at $61.68, an increase of $2.48 from last week. A total of 84 rigs are drilling horizontal wells, one is drilling directional and one is vertical. Oil and gas activity in Texas is off to a great start for 2018, with the Texas Railroad Commission (RRC) announcing it granted more permits in January than last year at this time. 2017 was a great year for drilling in Texas, with the Texas Railroad Commission issuing 30% more oil and gas permits than 2016. 2123 of those permits were granted to operators in Eagle Ford Shale counties, surpassing the total 2016 number of 1119. 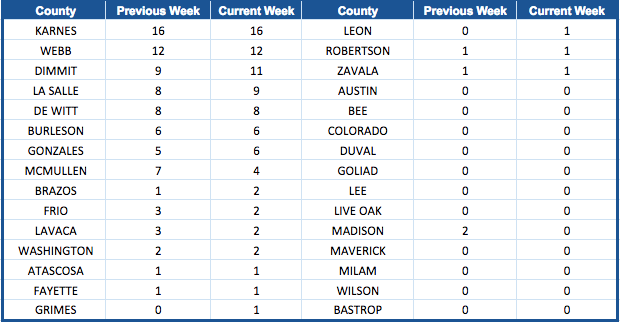 The Eagle Ford Shale rig count jumped this week this week by four, with data showing 84 rigs running across our coverage area by midday Friday. This is the first increase seen in the region in 2018. U.S. rig totals also increased as the industry saw commodity prices fall for crude oil and natural gas. A total of 975 oil and gas rigs were running across the United States this week. 184 rigs were targeting natural gas (+3) and 791 were targeting oil (+26) in the U.S. The remainder were drilling service wells (e.g. disposal wells, injection wells, etc.) 479 of the rigs active in the U.S. were running in Texas. 9 rigs in the Eagle Ford region targeted natural gas this week with the commodity trading at $2.59/mmbtu. 75 Eagle Ford rigs were targeting oil with WTI oil prices at $59.20, falling $6.25 from last week. A total of 82 rigs are drilling horizontal wells, one is drilling directional and one is vertical.